Notes: The last dive of a fantastic trip. See Dive #33 for photos. After some advice from the captain, the group decided to revisit the Split Bommie rather than endure a seasick-ridden journey to another site further out to sea. A storm followed us home. 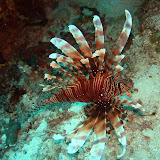 Notes: Some lovely photos of underwater flora. Notes: Nothing fractional about this dive site. 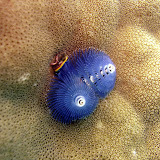 I saw the gills of a Christmas-Tree worm retract at my approach and had my first face off with a territorial Damselfish. 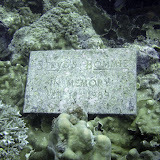 Notes: The name of this dive site is on a plaque at the bottom of the bommie. I don’t know who Steve was. 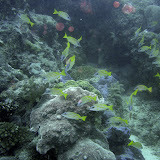 The word bommie, is short for bombora, “a shallow isolated piece of reef located a distance offshore“. Hell of a lot of fish. 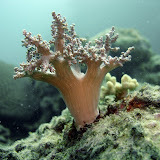 Notes: A gorgonian is an “order of sessile colonial cnidarian“. Only a few photos from this dive, and none of these. 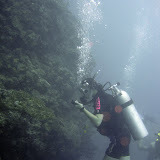 Notes: We went along a wall in this dive. So that must be referred to as a ribbon reef; the 9th, by someone’s count. We were plagued by some current so the photos are relatively few, though there’s a nice one looking away from the reef of a shark in the distance. Then there was a welcome tow back to the boat. Notes: Photos on Dive #25 entry. Equipment: No change from previous dives on this trip.